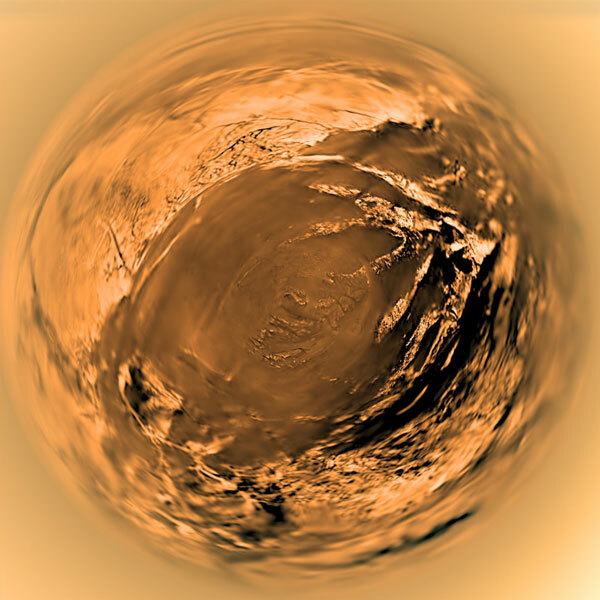 The European probe Huygens lands on Titan, one of Saturn’s satellites in 2005. A piece of the Cassini probe sent to know a little more of Saturn and its surroundings. The image is taken on the landing with a wide angle (why has this aberrant way), to see the atmosphere of this “moon”. Although the liquid touching expected, the probe landed on a rocky area after giving enough boats. He met with ice (frozen water) with a layer of methane (hence the yellow color) but confirmed the presence of liquid water (and liquid methane) on the surface of Titan. That is, Titan, the surface is composed of water and hydrocarbons in liquid and solid form that varies according to the gravity exerted by Saturn, creating channels and “seas” (dark areas). In fact, you can see these seas or lakes from a telescope in the hemispheres of the satellite. Something very interesting, what the hell.